Abstract: One of the major benefits of flash memory is that they are compatible with many of the data recovery programs designed to retrieve accidentally deleted files from computer hard disks. The flash memory-based USB key has become commonplace faster than just about any other computer peripheral in recent memory. It was only three years ago that a 32 or 64MB USB flash memory key was a rare and interesting item that would easily set you back a couple of hundred dollars. Now they are affordable enough that almost everyone who uses a computer has one. They've become boring and reliable, just like floppies and CDs before them. Flash memory devices have few major advantages over other forms of portable storage which easily account for their popularity. They have far greater capacity and access speed than the now antique (but not quite extinct) floppy disk, and are much more durable than either floppies or CDs. With the USB drivers now built into recent versions of Windows and other operating systems like Linux, they function just like a little portable hard disk, without the bulk and fragility associated with mechanical portable drives. In short, they're just about perfect. Just about...? That's right. Despite all their obvious advantages, USB drives and other flash memory devices like compact flash and SD cards are not without some problems and pitfalls of their own. In this Beginners Guide, PCSTATS is going to look at how flash memory works, what can go wrong with it, and how to recover and protect your data in case the worst does happen. What's special about Flash Memory? Flash memory's defining characteristic is its non-volatile nature. Traditional dynamic (volatile) computer memory needs a constant electrical charge in order to retain data, but the various types of flash memory do not. Like the EEPROM chips used to store computer motherboard BIOS information, flash memory needs electricity to write or read data from its banks, but retains the data when the current is gone. This makes it invaluable for use in portable devices with power constraints. This characteristic is achieved by using transistors as data storage devices. The transistors within flash memory can be induced to change their state (from a '1' value to a '0' value and vice-versa) with electrical current, but will retain that state in the absence of electrical current. Almost all modern flash memory devices use NAND flash memory, named for the internal logic arrangement of its memory chips. NAND flash chips are extremely compact and capable of fast read/write operations. A typical NAND flash memory device will contain one or more memory chips, very similar in appearance to those seen on memory modules or videocards, and a controller which handles the mediation between the memory and the interface connecting it to other devices. Almost all flash memory uses either the FAT-16 or FAT-32 file system, depending on the size of the drives. 'Card' based flash devices tend to use FAT 16, while USB memory keys are generally FAT 32. 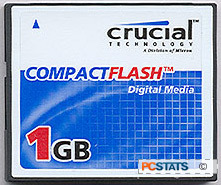 Most digital cameras and other devices will not read FAT 32 formatted flash memory. It may surprise you to know that FAT-16 is the exact same file system that has been used on floppy disks since time immemorial. No wonder the average PC finds it easy to read and write from flash devices... Once the USB drivers have done their work, it's essentially just a big floppy disk. Like all FAT formatted devices (FAT 32 is a file system often used on hard disk drives), flash devices must contain a Master Boot Record (MBR), Boot Sector (BS) and File Allocation Table (FAT). The File Allocation Table contains a list of the files on the flash memory device, their sizes and their actual location in memory. Anything reading from or writing to the device must read and update the FAT each time. Anything damaging the FAT causes serious data integrity issues for the device, which is why two copies are always present in different areas of the device's memory.